© All patterns mentioned at this website (if it is not written by different way) are copyrighted by and intellectual property of Vendula Maderska. The patterns are for personal use only. Any pattern or parts of it may be not reproduced, redistributed, resold, translated, published (on-line or printed), altered, shared or posted (for sale or free) over the Internet or off-line! Purchasing the pattern don't remove the copyright protection of that pattern but gives you the right to make items from it. You are allowed to sell the finished items handmade by you in limited series. If you will sell items based on my patterns anywhere on the Internet, please give a credit to me as an author of the design and write this text to your listing: "Crocheted by..... your name..., on the basis of design by Vendula Maderska, www.vendulkam.blogspot.com"
If you will have some question, feel free and write me. 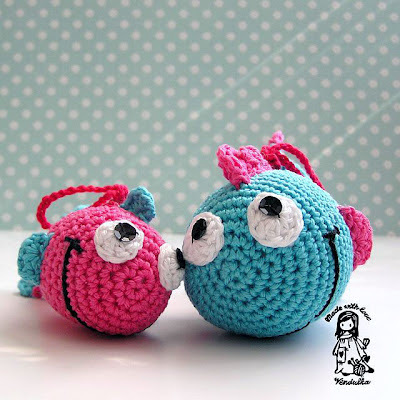 I wish you happy crocheting, quick hooks, nice customers and successful selling! Thank you, that you are respecting the copyright. I am very grateful for your loyalty.